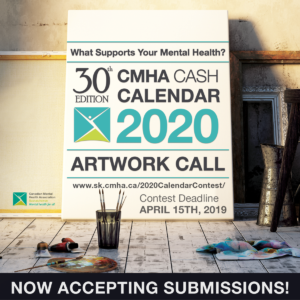 Welcome to the Canadian Mental Health Association’s Cash Calendar ART CALL! Our 2020 calendar marks the 30th year of our Cash Calendar Fundraiser! CMHA Saskatchewan Division and our local CMHA branches extend an open invitation to anyone interested in submitting artwork! This is a fantastic opportunity to get your work out into the public eye. We sell thousands of calendars each year raising funds for the “Friends For Life” program. Get in on the action! We will be selecting, from all entries, 1 piece for the calendar cover, 12 pieces for the months of the calendar, and a number of additional pieces that will appear in the back of the calendar. Additionally, pieces not selected for the calendar will be proudly displayed on the CMHA Instagram account (CMHA_SK). Anyone in Saskatchewan is eligible to enter and all forms of art are welcome! Our only stipulation is that your entry MUST have a relationship to your mental well-being. After all, CMHA Saskatchewan wants to know, “What Supports Your Mental Health?”. So, if drawing does wonders for your day, sculpture sooth your soul, or poetry perks-up your passions, send your work in and share. No need to be a professional, just come up with a fun, creative way to showcase how you help keep your mental health balanced. Poems are to be submitted as a word doc. Unfortunately, due to time restraints, we can`t take any submissions later than the cut off date. Winners will be contacted prior to the sale of the 2020 Calendars (around June, 2019). Cash prizes will be awarded to submission winners chosen for the calendar ONLY. 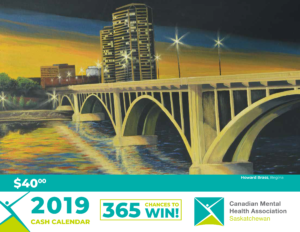 The CMHA Saskatchewan Cash Calendar has run for 30 years! In that time, the amazing people of our great province have supported this pivotal fundraiser, helping CMHA to provide important mental health services, support, and advocacy for people living with mental health conditions in Saskatchewan. We are fortunate and grateful to everyone who has purchased, participated, and promoted the Cash Calendar over that time. We’ve been privileged to be able to give back to calendar supporters with a daily prize draw for every day in the calendar year! We would also like to note that ALL PROCEEDS from the CMHA Saskatchewan Cash Calendar Fundraiser are used solely in Saskatchewan, for Saskatchewan mental health programs. 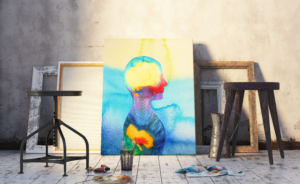 We hope that this call for artwork inspires you to continue supporting CMHA Saskatchewan`s great work, and gives everyone in our province a chance to share his or her mental health story. Good luck and get creating!